Many of you are already busy crafting for the Holidays. You started with some spooky Halloween crafts. Then moved to your Thanksgiving/Fall crafts and finally to Christmas crafts. But what if you are just starting crafting? Where do you begin? We have a few great holiday crafting ideas for the beginner. The projects range from ornaments to frames/plaque. Holiday Trees Photo Frame – Show off your holiday memories in this festive photo frame. Seasons Greeting Holiday Plaque – Welcome guests into your home with this “Seasons Greetings” plaque. These are just a few of our beginning crafts. 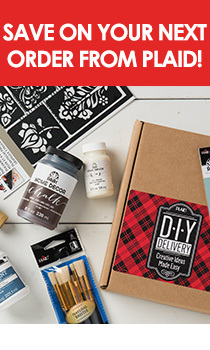 If you go to the Plaid website you can find more crafts perfect for the beginner!